This may also have to do with upgrading to Sierra and the latest Storyist, but the little red arrow and drop down menu for editing the various style sheets isn't visible on the Novel template sidebar. When I try and enlarge the page, the sidebar remains the same size so I can't stretch the page and enlarge the sidebar. I can barely see a little bit of the boxes to the right of all the spacing selections and tab section for editing those. Since I was looking for them, I can access the edit window which drops down in the middle of the page from the top if I click at the edge of the page by header, or section text, etc. If it's a Sierra problem, a new user running Sierra wouldn't realize they can edit or create new style sheets via this route. ... the little red arrow and drop down menu for editing the various style sheets isn't visible on the Novel template sidebar. The arrow is visible in the format inspector when the cursor is positioned in some text (and not in, say, the project view). It's only red if the selection overrides the style that is applied to the selected text. 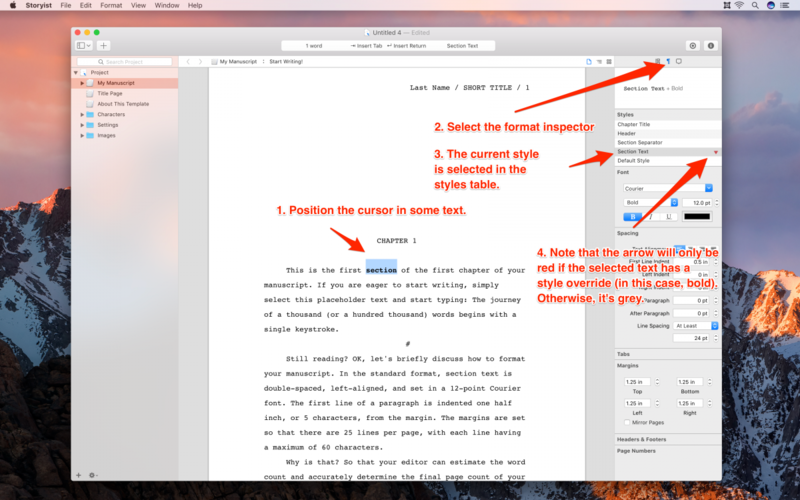 I've attached a screenshot of the Novel template on Sierra 10.12.4 showing what you should expect to see. Let me know if this isn't what you're seeing and we'll investigate. Thank you for sending the screen shot. The arrow is missing all the time in my current project window. If I can figure out how to get my screenshot on here, you'll see what I mean. I haven't checked all my files yet, but one out of four did show the arrow. If you notice on my screenshot, the up and down scroll arrows are missing beside "spacing" as well as the arrows. I realize they are only visible if there is a problem, but all I see is a tiny red dot which is probably the edge of the arrow. Okay, I can't figure out how to attach an image! When I hit image it wants an URL. I dropped the png into this reply, but it doesn't seem to want to open.